New Mercedes-AMG GT C Roadster. Mercedes-AMG is blowing even more fresh air into the AMG GT family. 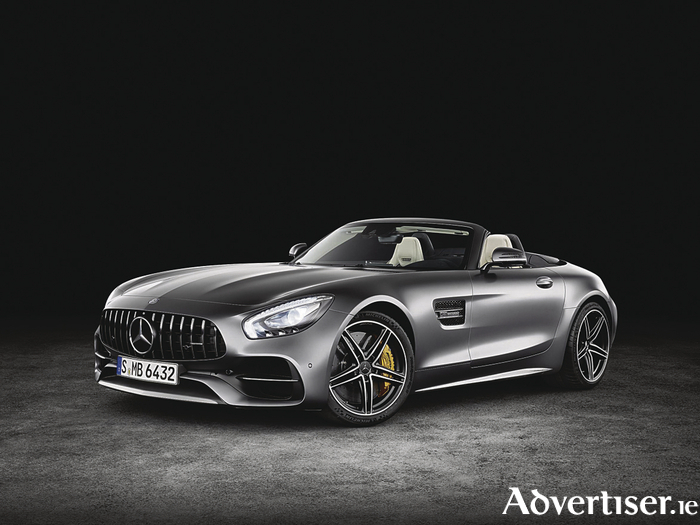 Shortly after the world premiere of the AMG GT R, the sports car and performance brand is presenting two exciting roadster variants of the two-seater sports car. Alongside the AMG GT Roadster, the AMG GT C Roadster enhances the portfolio with a completely new model variant. With an output of 410 kW (557 hp ) and peak torque of 680 Nm, the AMG GT C is the most powerful new Roadster variant and uses some of the technical refinements of the AMG GT R.
These include active rear axle steering and the electronically controlled rear axle locking differential. In combination with the AMG Ride Control sport suspension, the AMG GT C Roadster guarantees dynamic performance at the very highest level. The top Roadster also takes its lead from the top AMG GT R sports car where muscular proportions are concerned: the wider rear wings create space for a wider track and wider wheels at the rear axle, allowing even higher cornering speeds and excellent traction. The variable performance exhaust system also ensures an authentic V8 sound from the AMG Roadster. With the two Roadster variants the Mercedes-AMG GT family has now increased to five members. The two new sports cars with fabric soft tops likewise have the technical genes for which AMG is famous. These include, eg. the lightweight and torsionally rigid aluminium body shell, plus powerful and efficient V8 bi-turbo engines. The entry level into the Roadster world is the AMG GT with an output of 350kW (476hp ). The AMG GT C Roadster adds a completely new output level. With 410kW (557hp ) it is the more powerful of the two new open-top sports cars.